I am thrilled to announce that I have partnered up with Feld Entertainment to promote Monster Jam Triple Threat which is coming to Tampa Saturday August 25th. This means that I will be attending and I also have a four pack of tickets to giveaway. If you have not been to a Monster Jam, you have to go. It is SO much fun. There are tricks, flips, wheelies, HUGE trucks and so much more. There is bound to be lots of destruction and even more fun. Note: Trucks and drivers are subject to change. 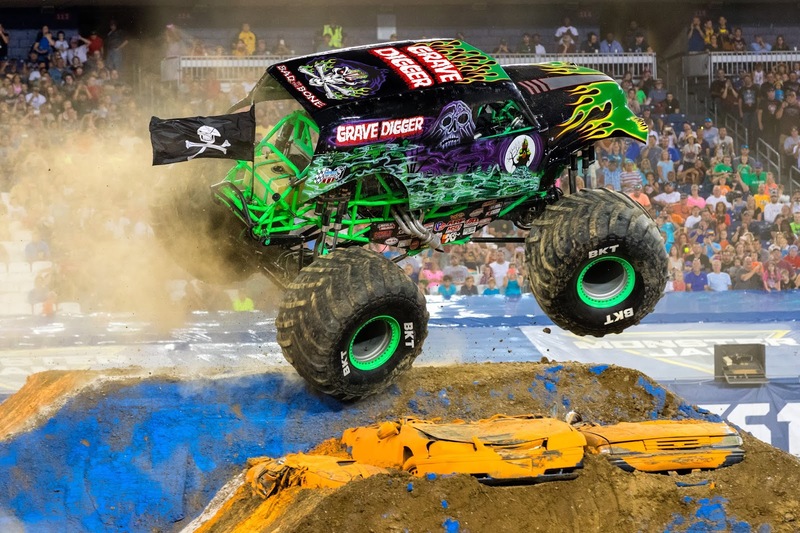 Unexpected, unscripted and unforgettable, Monster Jam takes center stage in the world’s most iconic venues like AMALIE Arena, sporting meticulously manicured dirt tracks created with the sole purpose of pushing these perfectly engineered, larger-than-life trucks to the limit. Monster Jam is one of the only sports where male and female world-class drivers, some generational rivals, are equals competing for the same championship on the same track. Following racing, just like the stadium show at Raymond James Stadium, Monster Jam fans in every city will have the chance to vote for the truck winner in the donut, wheelie and freestyle competitions by real-time, in-arena fan voting on their smartphones. This tour features two female athletes among the eight total competitors. For more information on Monster Jam, please log onto MonsterJam.com or follow them via their social channels: Facebook, Twitter, Instagram and YouTube. TICKETS: Tickets for all events are on sale now at the McDonald’s® Ticket Office at AMALIE Arena, Ticketmaster outlets and at Ticketmaster.com. Order tickets by phone by calling 800.745.3000. Tickets start at $15.00. Advanced parking passes are available at Ticketmaster.com or the ticket office. Visit amaliearena.com or call 813.301.2500 for more information. Group discounts available by calling 813.301.6900. *This post is sponsored by Feld Entertainment. They are providing free tickets for me and my giveaway winner in exchange for promoting Monster Jam. I was not compensated in any other way. We love going to Mondter Jam and this would be our first time at Triple threat. Our favorite part is the beginning when they all come out and the end when they go crazy! I’m excited to see all the action! Fun! I'd love to win these for my friend and her two boys! They love Monster Jam! I'd love to win these for my friend and her two boys. They love monster jam! Never been, but thought it would be something my nephew would love. Hope to win, my 2 kids would love going! Hope to see Megalodon at Monster Jam. Since commenting is mandatory to enter then technically only 7 people entered the contest? Me having over 80 extra entries and Rachel having only 10 extra entries? I'm just trying to figure out these odds so I can just accept my horrible luck and quit trying to win monster jam tickets. This is my 5th loss and I'm always the one with the most entries.